Among the plethora of vegan food eateries that have popped up recently, there has been a bit of a trend for food-coma-worthy but cruelty-free junk. That makes it all the more refreshing to go back to the essentials and eat vegan food that is actually, well, healthy. Smashing Kitchen is tucked away just off Mare Street. 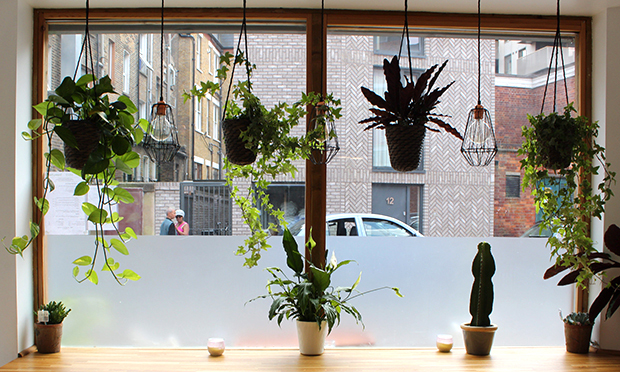 With its abundance of green potted plants lining the large windows on either side of the café, it’s an oasis of calm just off London Fields. It was set up by Asia Rybczynska, who after cooking countless experimental lunches and dinners for friends and family both in Poland and Hackney, decided to set up her own café. Her aim has always been to combine her interest in nutrition with simple, home-style cooking. She offers a fresh and simple menu, with options that are gluten-free, sugar-free and, of course, cruelty free. Asia guides my sister and me, running through the various ingredients that make up each dish. 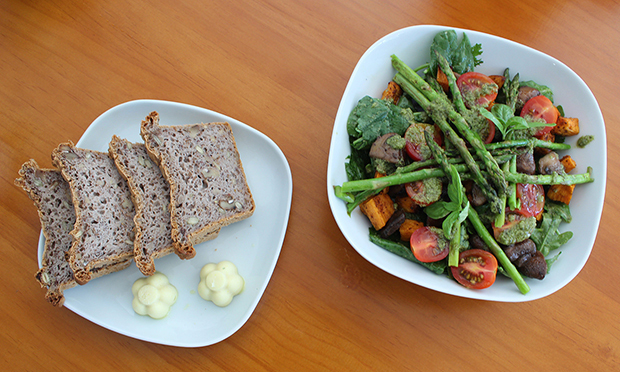 We start with a pesto salad packed with roast asparagus, sweet potatoes, mushrooms, cherry tomatoes and a side of buckwheat bread with vegan butter. The pesto is a revelation: light but pleasingly creamy with a citrus tang, it’s far tastier than most of the non-vegan alternatives I’ve tried. We later learn that it’s nutritional yeast that lends the sauce this creaminess, which certainly isn’t the most appetising sounding ingredient – but it certainly does the trick. However, the bread, despite having a rich nutty taste from the buckwheat, has a slightly rubbery texture. While touted as a far healthier option, gluten-free alternatives never quite seem to me to have the same fine crumb and springy texture as ordinary bread. Drinks-wise my sister sips a Kombucha, a refreshing mix of wild ginger and fermented tea with a zingy kick. I stick with a strong coffee with oat milk on the side, of course. Following Asia’s recommendation, we opt for the Thai burger and the falafel wrap. 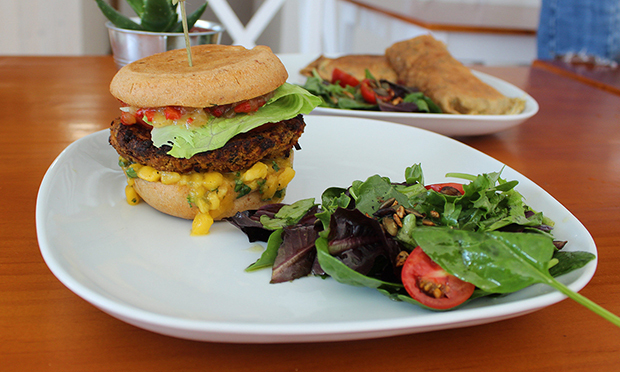 The burger is a hit: a well-spiced sweet potato and chick pea patty topped with a tart sweet chilli sauce and a heap of finely chopped fresh mango. Again, the bread is slightly on the chewy side- but the bold, fresh flavours of the burger make up for this. I would go back to Smashing Kitchen for this burger alone, when I fancy a virtuous lunch. My sister gives the thumbs-up to the falafel wrap. It’s stuffed with sweet potato falafel, pickled red cabbage, hummus and coconut yoghurt tzatziki. The wrap is light with a sourdough tang. We order our desserts: I plump for the mango and raspberry cheesecake; my sister goes for the chocolate mousse. Containing absolutely no refined sugar whatsoever, the desserts are surprisingly moreish. Asia talks us through some of the more unexpected ingredients that make up the cheesecake (cashews, coconut, milk, fresh mango and stevia) and the mousse (banana, avocado and cacao). Both are “sprinkled with a few secrets”, she adds. The mousse is perhaps slightly too bitter for my liking, although this is somewhat balanced out by the topping of shredded coconut, raspberries and blueberries. But the cheesecake is definitely a winner with its pungent coconut flavour, a generous helping of fresh mango studded throughout and topped with a sharp raspberry coulis. While not as obviously exciting as its flashier vegan counterparts in Hackney (The Brook, Temple of Seitan, The Spread Eagle), Smashing Kitchen is ideal for regular lunching. The café is not exactly cheap, however- it’s around £8 for a burger, and £7 for a wrap. I’d expect to pay a couple of quid less for each. Still, Smashing Kitchen holds its own amongst vegan eateries in the borough, with its high quality and well-presented fare.